One person has died and 35 others are ill.
A selection of pork on display in a butcher's shop. EDMONTON — Investigators have linked an E. coli outbreak that has sickened 36 people, including a person who likely died from the bacteria, to pork products from a meat shop south of Edmonton. 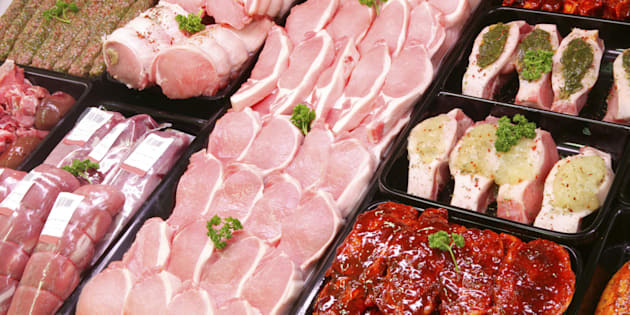 The Canadian Food Inspection Agency has issued a recall warning for pork products sold and distributed by the Meat Shop at Pine Haven between Feb. 19 and April 28. Alberta Health Services says there is a link between between the E. coli cases and meat from the business. It warns eating these products is a health risk. Both agencies say people should throw the meat away or return it for a refund. Last week, Alberta Health Services said 21 of the lab-confirmed cases were linked to Mama Nita's Binalot restaurant in Edmonton. Officials say the person who died did not dine at Mama Nita's, and there are no longer health concerns about that business. "All the cases that we've identified to this point have a linkage to some degree back to the meat shop," Dr. Jasmine Hasselback, medical officer of health, said Wednesday. "When we were looking at the foods people ate at the restaurant, there actually wasn't a consistent pattern at that time. It wasn't until we were able to start adding information regarding the individuals not linked to the restaurant that pork became clearer." E. coli O157:H7 infections are generally caused when a person eats food or drinks water that is contaminated with human or animal feces, or through direct contact with a person who is sick or with animals that carry the bacteria. Symptom can include bloody diarrhea, nausea, vomiting, stomach cramps and kidney failure.